There are so many animated movies being made nowadays that it’s sometimes hard to separate the good from the mediocre. Disney and Pixar often deliver. Illumination, Blue Sky and Sony are very hit and miss, and as for Dreamworks, they made a few popular series like Shrek and Madagascar, but they are never consistent. Apart from one franchise that never gets the attention it fully deserves. How To Train Your Dragon has quietly been a series that looks incredible, with state-of-the-art animation that even gives Pixar a run for their money. We get the third in the series, and some are saying it a better trilogy than Toy Story. Hiccup with his pet dragon, Toothless, are now the chief of the Viking clan and they, along with a group of misfits, are still saving dragons from the clutches of those who want to kill them. What Hiccup doesn’t know is that a master dragon assassin, Grimmel, is after Toothless and uses a female Night Fury to track them down. Hiccup, however, wants to find the mystical Hidden World, a secret Dragon Utopia so the creatures can live without fear of attack. 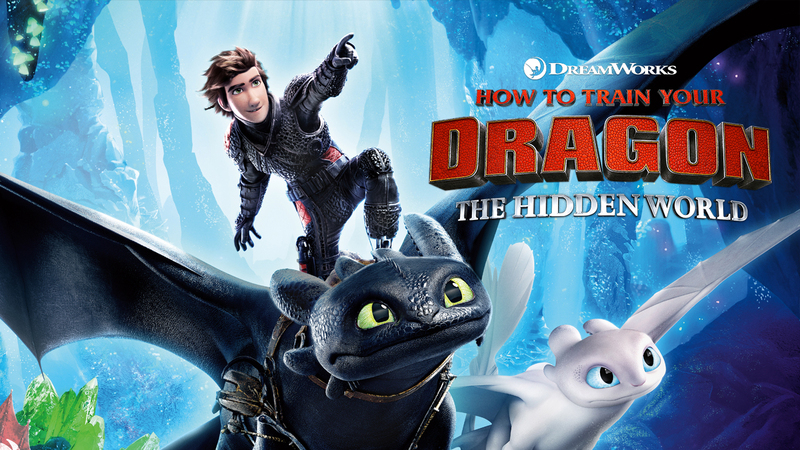 This third outing for Hiccup, Toothless and the gang of dragon savers doesn’t have the strongest of storylines. Unlike number 2, which came at you like The Empire Strikes Back with its very dark ending and a perfect example of how to bridge a trilogy. Number 3, however, doesn’t need to go into the same territory as the second film. Instead, this just needs to end it in the right way, and this certainly does. Before getting to one of the most satisfying endings in a movie for a long time, this is a rollercoaster ride of excitement and fun, with animation that has improved so much. Where the film works, best is in the visuals and having Oscar-winning cinematographer Roger Deakins on board as a creative consultant cannot hurt, especially when you know just how good he is at his job. So when the dragons are flying, you are with them, 100% of the way. When you get close-ups on the characters, the attention to detail is extraordinary. These are not just fluffy cartoons to fill the gap for hyperactive children on holiday. These are works of art. The film also manages to speak about the importance of friendship, trust, love and understanding among creatures and humans alike without ever once feeling you are being preached at and even if the story isn’t as strong as the previous films, there’s something for everyone to take home with them. What also works is how the film deals with a disability without ever ramming the point home. Both Hiccup and Toothless have prosthetics, and yet this doesn’t make them less of a person or dragon. Other films dealing with weighty issues should take heed. This is how you do it. The Hidden World is a delight from start to finish that will dazzle and amaze you. If you are a fan, you will know what to expect and just be prepared to blubber a little by the end. If you are new to the series, do yourself a favour: get the other Dragon films, binge-watch and then go see this. You will be surprised at what you have been missing.